United Nations Population Fund (UNFPA) organized a training in Ankara titled as “Training on the Minimum Initial Service Package (MISP) for Sexual and Reproductive Health in Crises” between September 18-20, 2017 which was funded by European Civil Protection and Humanitarian Aid Operations (ECHO) and the U.S. State Department’s Bureau of Population, Refugees, and Migration. 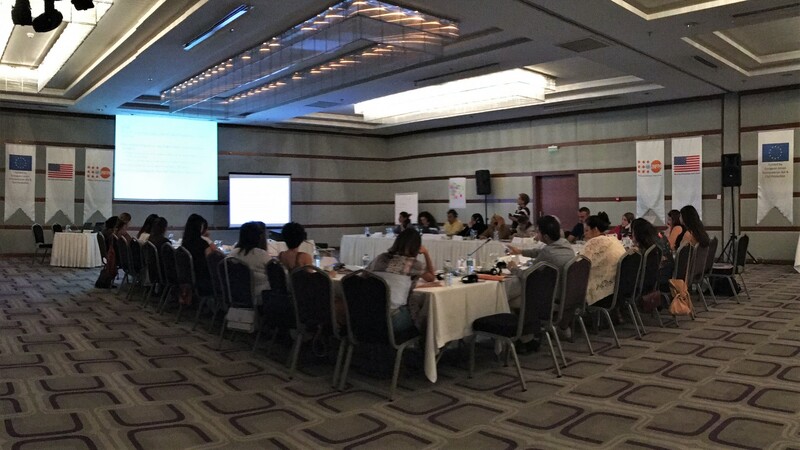 Approximately 30 health professionals - social service providers, midwives, psychologists - from 11 various provinces in Turkey, majority of them from UNFPA’s Women and Girls Safe Spaces, attended the training. The participants listened to UNFPA Turkey office’s experts’ presentations on the topics of sexual and reproductive health, sexual violence, gender based violence, mothers and new-borns’ health during and after crises. The main aim of this training is to reduce mothers and new-borns’ mortality rate during and after crises, to reduce & to interfere gender based violence cases, to lower sexually transmitted diseases and HIV/AIDS cases, and prioritizes family planning services to maintain mothers’ and family’s overall health. United Nations Population Fund (UNFPA) will continue organizing training sessions to answer the unmet demand in the area of humanitarian aid work in Turkey. United Nations Population Fund (UNFPA) is the lead UN agency for delivering a world where every pregnancy is wanted, every childbirth is safe and every young person's potential is fulfilled. UNFPA expands the possibilities for women and young people to lead healthy and productive lives. UNFPA established in 1969 and began working with the Government of Turkey in 1971. UNFPA Turkey office’s activities were initially carried out on a project-by-project basis. Today, UNFPA Turkey office has been working on the issues of sexual and reproductive health, gender based violence, gender equality, and runs a humanitarian aid program for the refugee population in Turkey. The first multi-year Country Programme ran from 1988 to 1992. The Sixth Country Programme (2016 to 2020) is currently underway. To accomplish UNFPA’s ambitious goals, UNFPA specifically focuses on four Sustainable Development Goals (SDG); SDG 3: Good Health and Well-Being; SDG 4: Quality Education, SDG 5: Gender Equality and finally SDG 17: Partnership for the Goals. To learn more about the United Nations Sustainable Development Goals, please click here.